Q- How do you get Henry on your back? A- I made a little video, here are two great techniques for getting baby on your back. Q: Was Josh on the babywearing board right away too? Or did he come to it later? Are there wraps/carriers that he prefers over others? A: Wearing Henry made sense to the both of us from day one. We have never used his stroller, as we both find it much, much easier to throw him on and go- whether it’s walking the dogs, shopping, commuting via train in the city, or just a walk around the block. No folding and unfolding the stroller, no wrangling the dogs and the wheels, and an added bonus that I wasn’t anticipating; Henry gets to see and hear everything instead of spending his time at knee level. 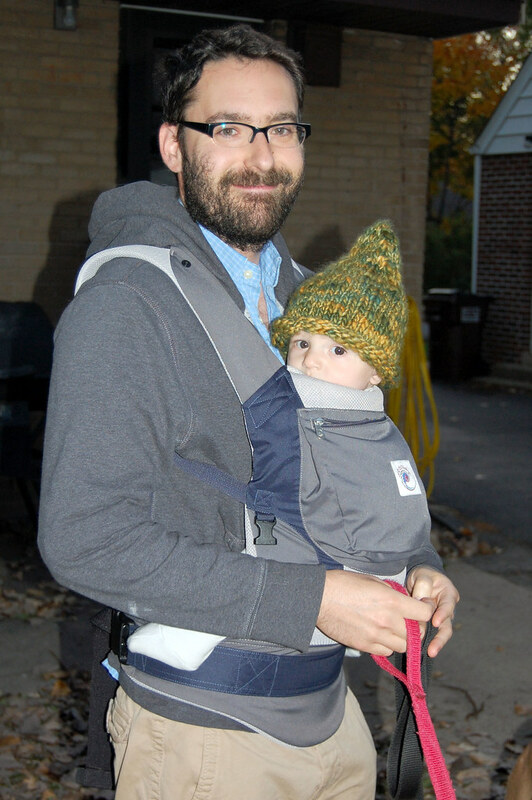 Josh’s favorite carrier is the Ergo, when Hen was tiny we used the infant insert and this allowed the Ergo to grow with him. At 18 months Henry has finally outgrown the Ergo (not the weight limit, but he no longer gets knee-to-knee support and it’s not as comfortable for Josh) and Josh has started using wraps when he needs to get Henry up. Be still my heart. Q: My kid hates being carried – or at least, did untll I gave up on it a few months ago. She’s 7 months old now – is there anything I can try to make her tolerate it? A: I never really know how to address this question, because I don’t have all the information. 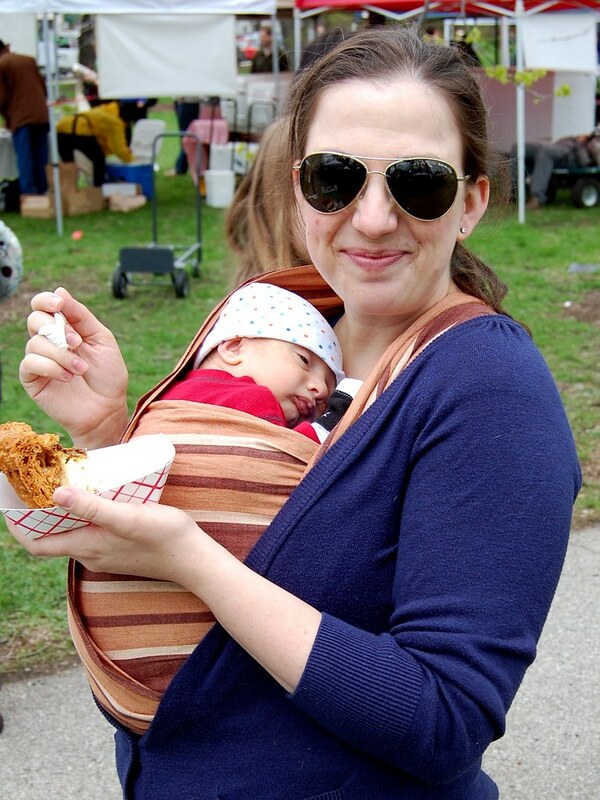 I don’t know what kind of carrier you were using or if you had your baby properly positioned. A different carrier might help, working on positioning might do the trick, some babies (mine included) might fuss and fight being wrapped but settle right down once they are snug as a bug back there. So I think your best bet to troubleshoot these issues is to find a babywearing meeting near you. Q: I know I want wear my baby but I don’t know where to start. There are so many carriers and they are all so different- ringsling, moby wrap, ergo, not to mention all the beautiful wraps and different carries that you use! And they’re not cheap so i can’t just buy everything that catches my eye. So where should I start? A: Well the best way to try a lot of different carriers and find the one you like without a big investment is to find a babywearing meeting near you. Q: How do I find a babywearing meeting near me? A: I started out with a Moby, I used it twice and knew pretty quickly that I liked wrapping but that a Moby wasn’t for me. I found the Moby very hot, too stretchy and very long. There is a lot of fabric to contend with when using a Moby and I found it overwhelming. I was worried about giving this advice as a lot of people like the Moby and it is a cheap and easy to find option, and really, if you can’t find anything else it’ll do the job and you’ll be cuddling your newborn and you’ll be happy…but after talking to some friends I know my experience isn’t unique so I’ll tell you, I really believe that a German style woven wrap (non stretchy) is your best bet. My favorite brand is Didymos, I think they make consistently quality wraps. To any new wrapper, especially one wrapping a newborn I would suggest a size 6 (size 5 if you are very small) cotton wrap in any color or pattern you love. The more you like it the more likely you are to use it. A cotton German style woven- not a gauze wrap- can be pricey- around $130+ new; they can also be found used on various swap and FSOT sites, and this week a lot of vendors are having terrific sales 20%-25% off for International Babywearing Week. Kicking off International Babywearing Week by wrapping the chump up for a trip to the pediatrician. I cannot exaggerate the joy that Babywearing has brought into my life since becoming a mom. Not to mention, it’s made this gig a whole lot easier. I’ll be talking about Babywearing and answering questions all week, so please leave a question in the comments if you’ve got one. Babywearing hugs are the best!